A low cost, simple and easy-to-use, palm-sized reader for the GS1 and GS3 soil moisture, temperature and salinity sensors. Spot-check your soil volumetric water content, temperature and/or salinity in the field, laboratory, glasshouse or greenhouse. The Soil Moisture Meter is ideal for checking the water content of pots or shallow soils. It is also ideal for students and teaching. The TEROS-10 sensor (formally known as the GS1 sensor) is a robust, accurate sensor that can measure soil or substrate water content. The TEROS-10 has two, 5cm length stainless steel needles that are extremely rugged. They can be inserted into just about the hardest clays. The TEROS-10 can measure mineral soil, as well as substrates such as potting mix, perlite, peat or any other type of material. Based on the capacitance, or frequency domain, measurement principle, the TEROS-10 is pre-calibrated with the PROCHECK handheld meter to provide direct readings of substrate moisture. The TEROS-10 is ideal for nurseries, pots in glasshouses, teaching students, or for a low-cost option to check substrate water content. More information on the TEROS-10 Moisture Sensor. 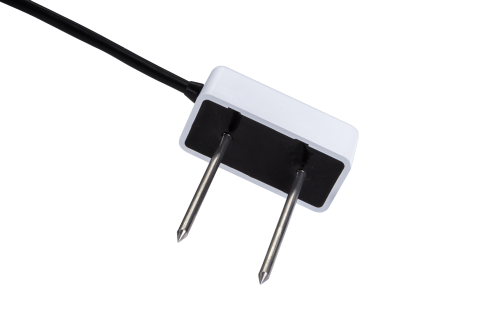 The TEROS-12 sensor (formally known as the GS3 sensor) is a three-in-one sensor measuring water content, temperature and electrical conductivity (EC). 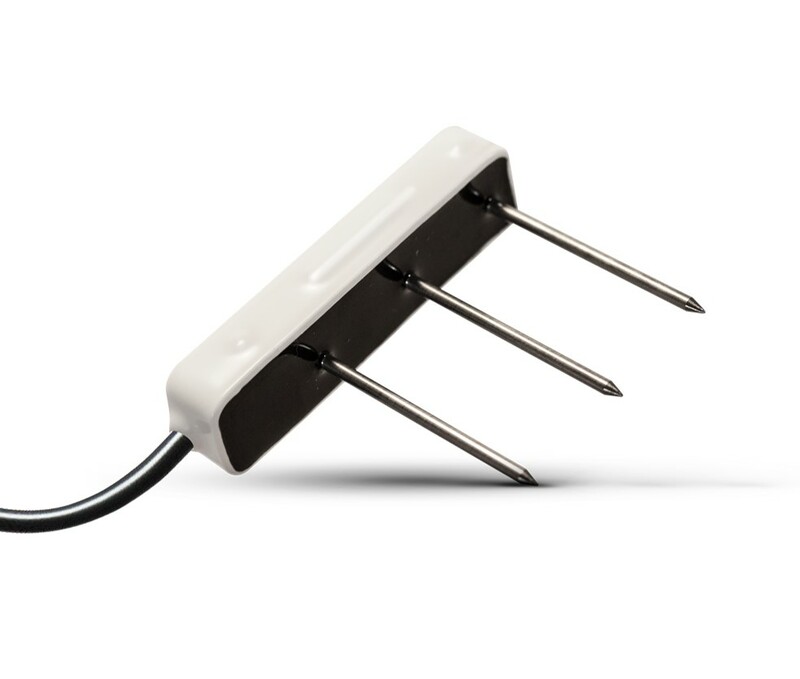 The TEROS-12 is similar in function to the TEROS-10 sensor, however it has the added features to measure temperature and EC (or salinity) of substrates. Therefore, the TEROS-12 is ideal for projects that require knowledge of EC dynamics – such as salinity or nutrient dynamics in the soil. Similar to the TEROS-10, the TEROS-12 is ideally used in porous soils or media such as potting mixture and sands. More information on the TEROS-12 Moisture, Temperature and EC Sensor. 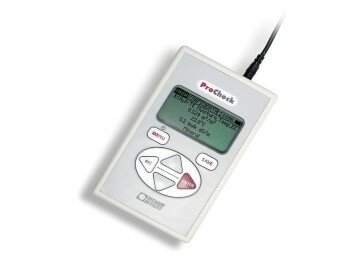 The PROCHECK is a low cost, easy to use, versatile handheld meter for the TEROS-10 or TEROS-12 water content sensors. The sensors easily connect into the top of the PROCHECK via a stereo plug. 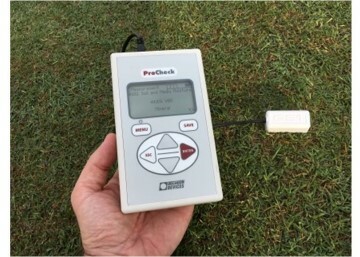 Turn the PROCHECK, select whether you are using a TEROS-10 or TEROS-12 sensor from the available sensor list, and start taking measurements. It is very easy to use! Values from the sensors are display on the LCD screen. These data can be stored inside of the PROCHECK for later download into an Excel file. 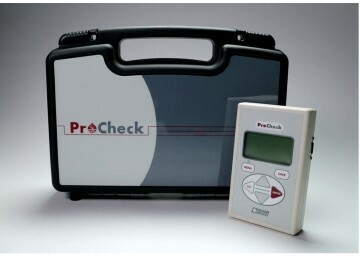 The PROCHECK can store up to 5,000 readings. Each reading includes sensor type, date, time, raw value, calibrated value, and calibration coefficients. There is also the option to switch between calibration types whether you are measuring a mineral soil, potting mixture or other soilless substrate. The PROCHECK includes the ability to calculate and display the average and standard deviation for sequentially collected portable measurements. 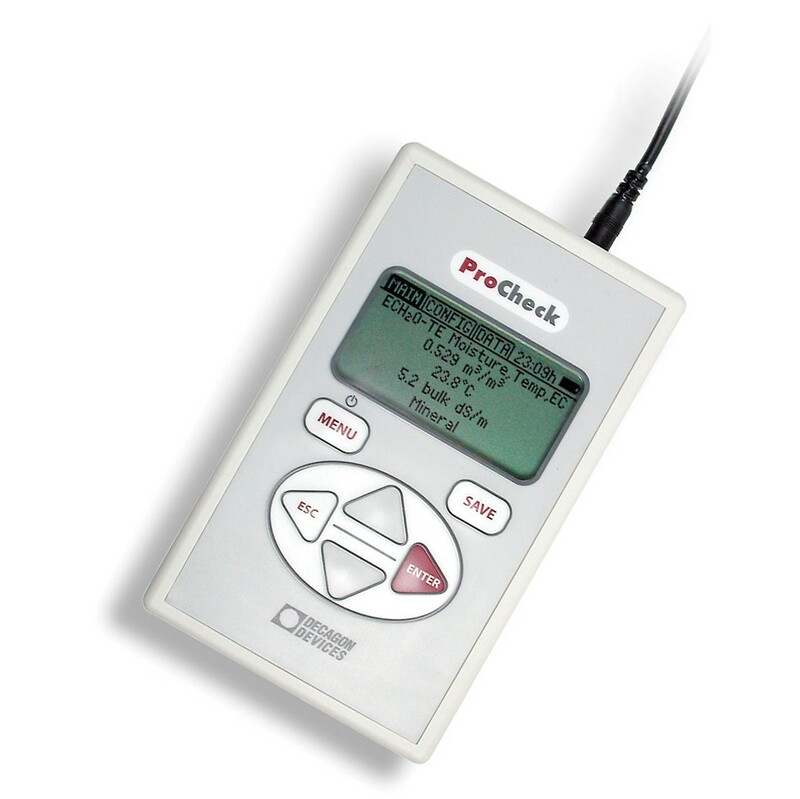 The PROCHECK is operated off AA batteries that have a lifetime of many months to years. The PROCHECK also comes in a hard-shell, robust carry case for maximum protection during transportation. 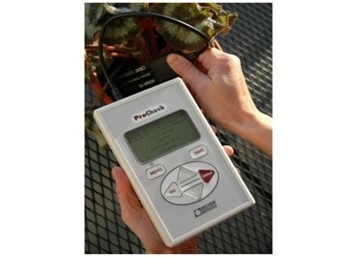 More information on the PROCHECK handheld, portable meter.